Funny Magician Michael Kent will present his show in Radford, VA, Indianapolis, IN and Manhattan, KS in upcoming weeks. His comedy magic style has been seen on The CW Network’s “Penn & Teller: Fool Us!”, in over 500 colleges in 47 states and 15 countries. Having been named Entertainer of the Year and Magician of the Year, he is one of America’s Top Funny Magicians. His show includes fast-paced audience interaction, comedy routines, improvisation, mind-reading and story-telling. Highlights from the show include his famous “Chicken Trick” and the “Multiplying Bottles,” which he performed on national television for famous Funny Magicians Penn & Teller. Michael is constantly improving and changing his show, which he says keeps him on his toes. In addition to performing in America’s colleges and for some of the country’s top corporations (Disney, AT&T, Ernst & Young, PwC, Honda, and more), he is proud to have supported the troops on multiple overseas tours to perform for our fighting men and women. The June 30 show in Radford, Virginia will be for the VA Governor’s School, a month-long program for high-performing high-school students who will be studying performing arts and humanities at Radford University. Michael’s return performance for this very special group of young people will be followed by a talk about social capital and a Q&A session. 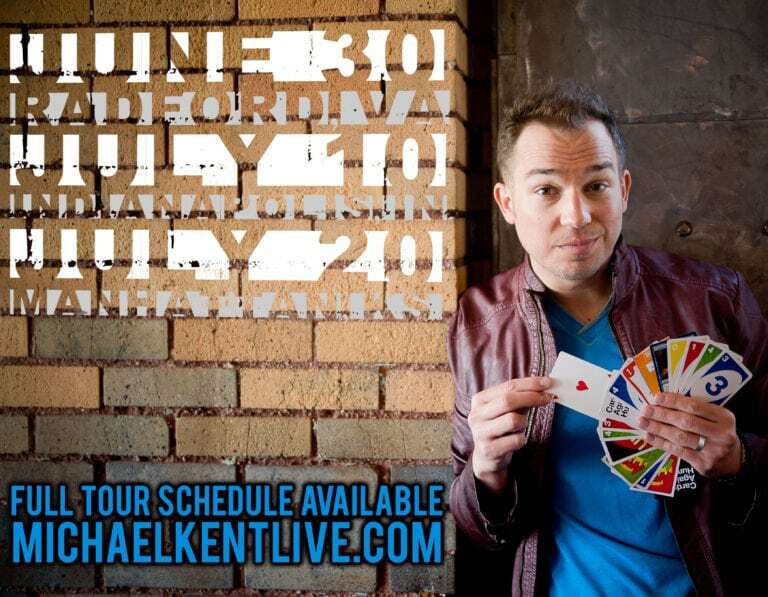 The July 10 show in Indianapolis, Indiana is Michael’s debut performance at Taylor Martin’s Indy Magic, a monthly show where Michael will appear along with magician Lion Fludd and fellow Funny Magician Nathan Kranzo. On July 20, Michael will be performing a public show in Manhattan, Kansas for their downtown Arts in the Park program. You can learn more about Michael here. For up-to-date info, visit Michael’s Facebook Page. For information about how to book Michael for your own private or public event, contact his booking representatives here!